On August, 27, an "Inspiration" amusement fountain from the «Pretty City» series was commissioned by specialists of the Borond Group in Magadan. It became the largest fountain in the regional center. Bowl diameter amounts to ten meters, with city emblem at the bottom of bowl, made in the technique of mosaic. 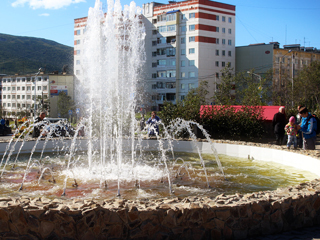 Fountain became a present for the 60th anniversary of the Magadan region. 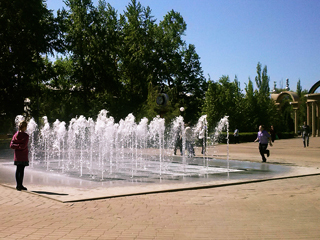 On August, 30, 2013, another one serial amusement fountain commissioned in Mytishchi town near Moscow. The opening ceremony of the «Spiral» fountain, which placed on Veterans Boulevard became a real holiday for inhabitants. The construction of a «Spiral» amusement fountain was held, as usual, in a short time. Thanks to the quick installation the opening took place on City Day. Now in Mytishchi there is another one recreation area, furnished with love and taste. Three of serial fountains has commissioned on August, 27, in Palatka village, the administrative centre of Khasan district of the Magadan region. Sixty years ago, in 1953, Magadan region was created. In the same year Palatka became a city type settlement. We can proudly say - it's jubilee. And such a gift for the anniversary received by the residents of the village. As Governor of the Magadan region, Vladimir Pecheniy, noted - a joint work of state power and local self-government creates more comfortable conditions of life, improving the life quality for people. Much is done for life improvement in Khasan district - and now Palatka appeared amusement fountains. Two of them - from the «Sculptural» series, and the third, with larger diameter — from «Inspiration» series. 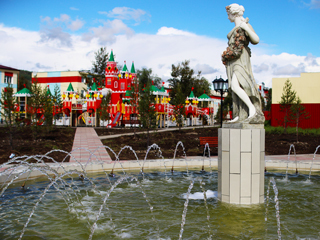 A new serial amusement"Sculpture" fountain opened in Ola village, Magadan region. Its opening took place on 23 August 2013. There is in the Magadan region, on the shore of the Tauyskaya Guba of the Okhotsk sea, the village of Ola. The village is small, just over six thousand inhabitants, but with a long history. In August, 2013, Ola celebrated its 297 anniversary. These days inhabitants of Ola got a beautiful present - a fountain was opened on the square in front of village Culture center. 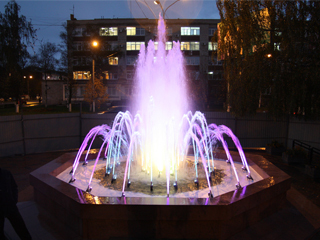 «Sculpture» amusement fountain in shortest time was built in the village by specialists of Borond Group. 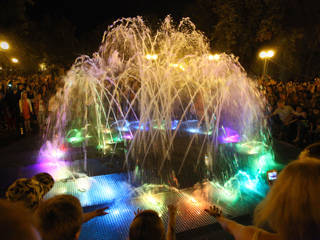 A new serial "Tic-Tac-Toe" fountain opened in Korolev. Its opening occurred July 6, 2013, to celebrate the 75th anniversary of the city of Korolev. Weather in the City Day was hot. By noon, the thermometer stood at 30 degrees Centigrade. Residents of the city were able to cool off in the main city square — after reconstruction there once again earned a fountain. 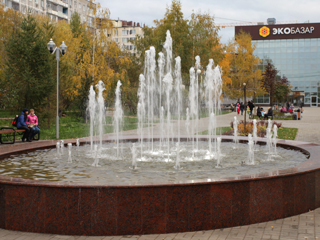 Another fountain in the "Beautiful City" series was commissioned in Liski Town (Voronezh region). "Tic-Tac-Toe" amusement fountain is set to town recreation park. Its opening was dated to the 10th anniversary of the park. This fountain has become the new recreational and entertainment center of park: there is a unique children's playground in the afternoon, which is transformed into a colorful water show in evening. A production of "Pretty City" fountains series started by Borond Group. The first one of this series, "Inspiration", already delivered to the customer - the administration of the Tver City. 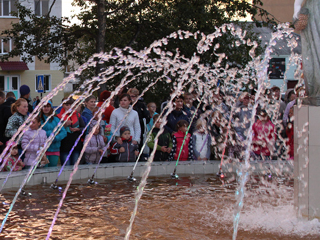 The Grand opening of the fountain was held on October 14 at the Komsomolsky Avenue in Zavolzhskiy district of Tver. 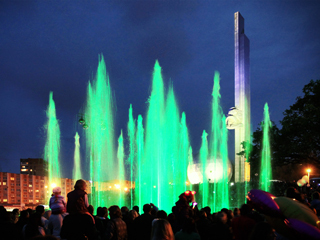 On September, 29 was held the opening of the amusement musical fountain "Tornado-24M" in Novovoronezh. This project became the first of a series of typical new generation "Tornado" fountains, realised by our company. Now "Tornado" has become larger and more powerful. Diameter of the fountain is 24 meters, the height of the central jet - up to 20 meters. An amusement musical fountain "Tornado-24M" in Novovoronezh is a gift from the nuclear industry to the 55th city anniversary. In the solemn day, which had been warm and sunny, citizens of all ages gathered in the square near the fountain. The kids played between the jets of water, the couple posed for photographers on the background of the new city sights, and all, without exception, were impressed with the "Tornado" musical show. 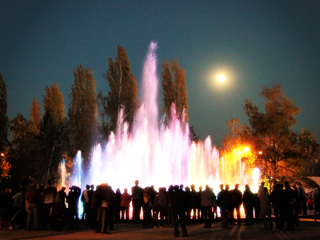 On August, 25 was held the opening of the amusement musical fountain "Tornado-15M" in Kaluga. Its opening was timed to the City Day. Long before it was dark, Kaluga citizens stretched to the bridge over the Oka river, where on the high bank built our fountain. On the stage were the musicians of the group "Chizh & Co". During their concert the first jets of the fountain went up to the sky... After the musicians played their program, started a merry discotheque. From the square, of course, no one disagreed, and the most daring, despite the cool of the evening, even bathed in the fountain jets. When it was quite dark, "Tornado" musical show lit up with lights of the festive salute. A good gift received Kaluga to the City Day.